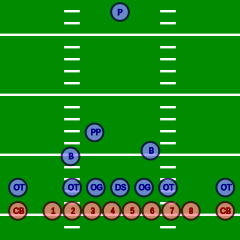 Diagram of a punt formation, the long snapper is indicated by the blue "DS"
In gridiron football, the long snapper (or deep snapper) is a special teams specialist whose duty is to snap the football over a longer distance, typically around 15 yards during punts, and 7–8 yards during field goals and extra point attempts. A good punt snap should hit the target (namely the punter's hands at the abdomen or waistline) between .65 and .80 seconds and with a tight spiral for easy handling. A "bad snap" is an off-target snap which causes the delay or failure of a kick and/or forces the punter into a potentially compromising situation. In addition, in the NCAA defensive players who play opposite of the long snapper are not allowed to initiate contact with the long snapper until 1 second after the ball has been snapped. Unlike college, NFL rules do not provide for a set period of time after the snap before the long snapper can be engaged by the defense. 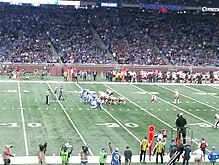 However, no defensive player can line up directly in front of the long snapper when the offense is in a kick formation. Officials generally enforce this rule through verbal admonishment to an offending player prior to the snap. If the defensive lineman moves into a legal position before the snap, no flag is thrown. Todd Thomas was the first known player to be selected for his long-snapping abilities, in the fifth round (124th overall) of the 1981 NFL Draft, by the Kansas City Chiefs. He served as the long snapper for the Chiefs during the 1981 season, however, after that season he was primarily used as a Tight end/ Tackle. 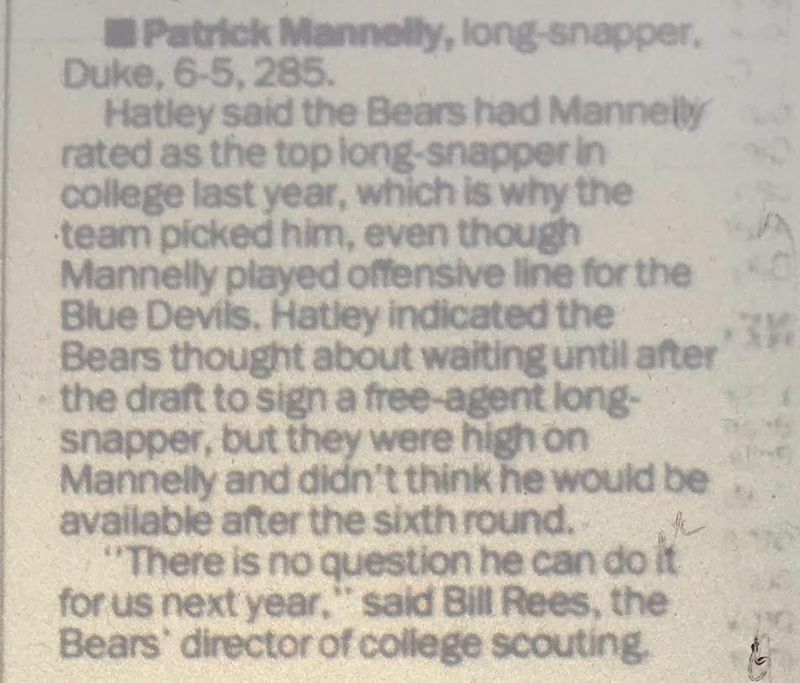 Patrick Mannelly was selected in the sixth round (189th overall) of the 1998 NFL Draft, for his long snapping abilities by the Chicago Bears. He is known as the "de facto" first player ever to be selected specifically as a long snapper. At the time draft records listed the Duke alum as a Guard, but he served as the long snapper for the Bears from his first season onward. In 2019 the Patrick Mannelly Award, given to the best long snapper in college football, was created. Dan O'Leary was selected in the sixth round (195th overall) of the 2001 NFL Draft by the Buffalo Bills, although he was drafted as a tight end. Jimmy Landes was drafted as a long snapper by the Detroit Lions in the sixth round (210th overall) of the 2016 NFL Draft, before going on injured reserve and being released the following year. Colin Holba was drafted as a long snapper by the Pittsburgh Steelers in the sixth round (213th overall) of the 2017 NFL Draft. Hunter Bradley was drafted in the seventh round (239th overall) of the 2018 NFL Draft by the Green Bay Packers. Several other players who went on to be their team's long snapper the following season have been selected but were listed at different positions during the draft. For example, Brad St. Louis was listed as a tight end in the 2000 NFL Draft, and Jake Ingram was listed as a center in the 2009 NFL Draft. ^ Kohl's Kicking Camps (29 July 2013). "Snapping Competition To Play In Under Armour All-America Game" – via YouTube. ^ "NFL and NCAA Rules Regarding Snappers". 29 August 2010. ^ "Texans Sign Free-Agent LB Aldridge". Archived from the original on 2012-11-05. ^ "Draft report on Patrick Mannelly". Chicago Tribune. 1998-04-20. ^ Biggs, Brad (January 15, 2019). "Patrick Mannelly Award created to honor college football's best long snapper: 'They need to be recognized'". Chicago Tribune. Retrieved January 15, 2019. ^ "Player Bio – Steve Kidd – Football". Retrieved on 2007-04-30. ^ "Seattle Seahawks: Tyler Schmitt". Seattle Seahawks. Retrieved 10 February 2014. ^ William C. Rhoden (2003-01-06). "Sports of The Times; Kicking Mishap Concludes Story With 2 Views". New York Times. ^ "Long snapper's injury really hurts Steelers".